Inbound marketing is a marketing method designed to attract prospects to your company’s website by offering relevant content and quality services. This strategy is moving away from conventional methods of intrusive marketing. Inbound marketing evolves in 4 key steps, using different practices to convert a prospect into a loyal customer. 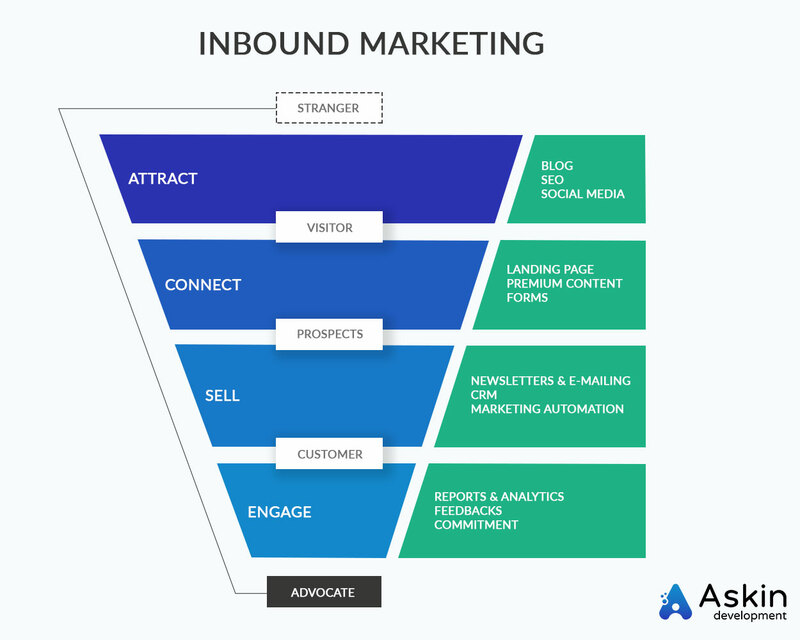 Here is the funnel of conversion of inbound marketing. At first, it is important to think carefully about an inbound marketing and content marketing strategy. Our web agency based in Lyon helps you set up different inbound marketing practices and defines the most relevant premium content to highlight. You should offer premium and free content to your visitors: white paper, study, podcast, tutorials, webinar … These high-value content can generate leads if you request an e-mail in exchange for downloading. With a form, you can also qualify your contacts. By offering content tailored to each stage of the customer journey, we can maximize the chances of recovering contacts. We offer you the production of white papers and infographics as part of your Inbound Marketing strategy. The landing page is used to promote premium content to users, and is part of the second stage of the conversion funnel. To build your landing page, our web agency makes layout recommendations, graphic models and offers a tailor-made development. You’ll get a personalized and engaging page, including appropriate Call-to-Action (CTA). It designates a button on which you are invited to click. These CTAs must be convincing and appeal to visitors. You do not have to be an existing customer to create a link with your company. The newsletter is the best way to create and maintain this link to convert your prospects into customers. Our web agency helps you in creating the content of your emailing, the sending (that can be automated) and carries out complete reports. Creating a standard email schema can help you to convert your leads. Askin supports all your emailing campaigns and helps you set up marketing automation scenarios. Our agency assists you in setting up a suitable CRM. We also offer the development of a CRM that meets your needs. The ability to contact prospects effectively is directly correlated to the development of a business. That’s why CRM is an essential tool for inbound marketing. It is on a blog or a news page that the articles with high added value are generally published. By establishing a content marketing strategy beforehand, the blog will allow you to become your own media. You will be able to attract visitors and generate traffic. The blog also helps boost natural search by publishing news regularly while using the right keywords. Our web agency offers writing options to help you publish content more regularly on your website. From an inbound marketing perspective, we can also automate the sharing of your news on your social media to increase their visibility and gain more traffic. Traffic acquisition on your website via search engines comes under inbound marketing. SEO is a set of techniques designed to optimize the visibility of your website, your blog and your premium content in search results pages. The improvement of SEO is a long-term task that relies on the definition of relevant keywords, the optimization of the website and the creation of quality content. Askin offers you subscriptions including all these benefits. We also have more specific options like our SEO service for a website redesign. This option is particularly suitable for companies that want a new website adapted to their new marketing strategy. Consolidate your inbound marketing strategy! By applying the different practices of the conversion funnel, our web agency located in Lyon helps you to build your strategy of inbound marketing, to generate traffic and qualified leads.